8bitSF is back and invading DNA LOUNGE with an absolutely HUGE show this month. San Francisco's very own A_RIVAL is unleashing his blistering new disc "8-Bit Pimp". To back him up, we've assembled venerable 8bit warriors GLOMAG (NYC), COMPUTEHER (LA) and X|K (SF) as well as residents STARPAUSE and CRASHFASTER. Do not miss this amazing lineup! Tickets are on sale now at DNA Lounge! Spread the word via our event page on Facebook. Concert/listening party/Street Fighter 4 challenge! 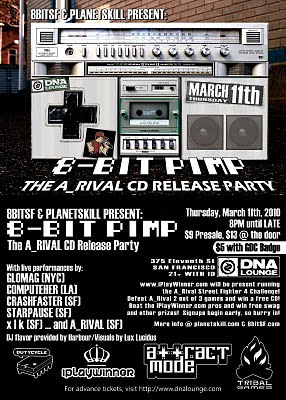 "8-Bit Pimp", the debut album of Chip-hop pioneer A_Rival, marks the first hip-hop album with original beats composed entirely using the sound chip of the Nintendo Entertainment System. Featuring collaborations with artists such as Random (Mega Ran), this album also bridges the gap between hip-hop and the burgeoning San Francisco Chiptune scene. Also: iPlayWinner.com will be presenting the Street Fighter 4 Album Challenge! Defeat A_Rival 2/3 at Street Fighter 4 and recieve a free album and other prizes!